If your company’s cases, packs, items and other groups have grown in complexity and become impossible to keep track of accurately, then flexible Units of Measurement can come to your rescue. Bonus: The Enterprise edition of AccountMate offers Storage as a fourth unit of measurement in addition to Purchase, Stock and Sell. 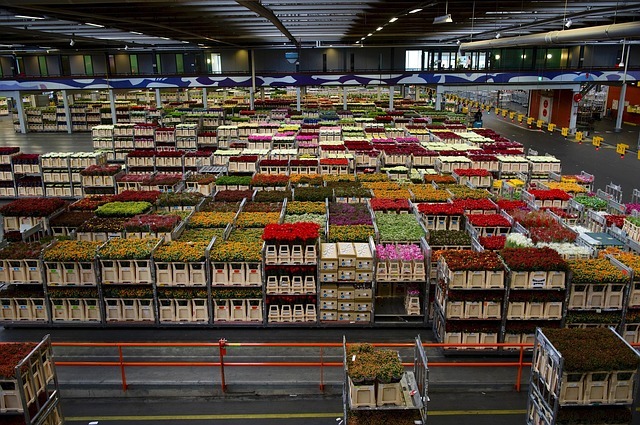 For example, you might Stock an item with a unit of “each” but Store it in your warehouse in boxes of 100. Thus you could add a Storage unit of “box” that contains 100 each, so that you can easily count and input the number of unopened boxes for inventory purposes. Whatever Multiple UoM you require as a distributor or manufacturer, you can get an AccountMate accounting and ERP system that makes it easy to manage your items as you purchase, stock and sell inventory. 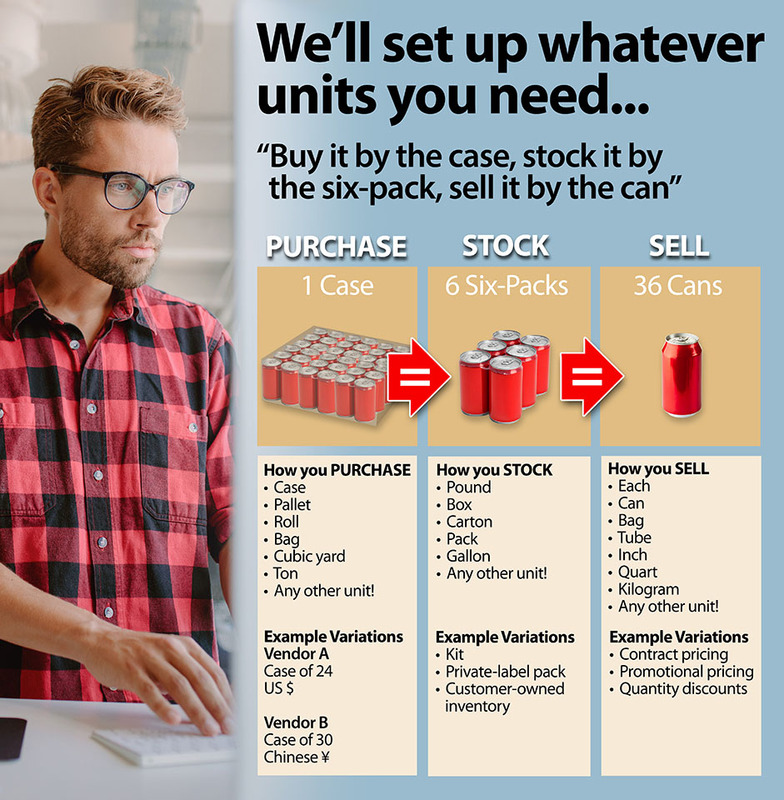 Any numeric formula can be used to break down the units you purchase into the units you stock and sell. Even if you have unusual or weird units of measurement. Plus: Account for special pricing in your statements, reports and sales commissions automatically. Define how units can be transacted to prevent on-hand inventory mistakes. The Enterprise edition of AccountMate lets you specify the choices that display to your users when an item is looked up. For example, if an item is set up as a 2-Pack but it’s ONLY authorized to be sold as Each or Dozen, then you can make sure that the 2-Pack configuration isn’t displayed as an option for orders. Each item’s stocking, sales, purchase and storage units may be authorized separately via simple check-boxes to prevent unit-related errors on transactions. Our AccountMate solutions come standard with the ability to handle just about anything that a wholesale distributor or manufacturer could want for complex inventories and supplier networks, large inventories across multiple warehouse locations, and ongoing changes in the market and the company. AccountMate is the only mid-tier accounting and ERP software that makes its source code available to customers. When you own your source code, ANY aspect of the software is customizable by us or by you. You’re not limited to customization options on a menu somewhere. If you’re trying to do Multiple Units of Measurement in QuickBooks or other accounting system but it won’t let you set things up the way you need them, AccountMate can do it. You don’t need to buy a high-end system that takes months or years to put into place – AccountMate costs less than a tenth of those big-name systems and we usually go live with a new system in a couple of months. Here at NexLAN we’re experts at implementing and supporting AccountMate well and we can give you many references. P.S. Are there really no UoM limitations? Well, some companies have a direct correlation between their multiple units of measurement that is custom for every item. Maybe they buy wire by the foot and sell it by the pound, and the direct correlation depends on the gauge of the wire. A handful of items like that is no problem. If you have thousands of items like that, we can do it but not in a cost-effective manner. Other than that, we can’t think of any units of measure that people have thrown at us over the years where we didn’t come up with a clean way to set it up for them. We love a good challenge, so tell us what you’ve got! Give us a call to discuss your Multiple UoM wish list.